The bathroom represents so much more than a place to maintain good hygiene. If designed correctly it can provide us with a peaceful private place to unwind from the stressful tension of the day. 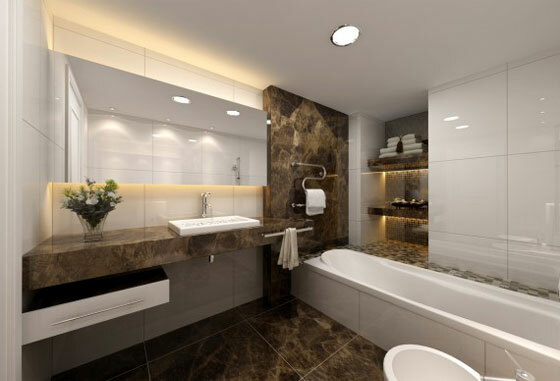 There are some key elements in bathroom designs, such as lighting, color, texture, tiles, appliance and bathroom furniture. 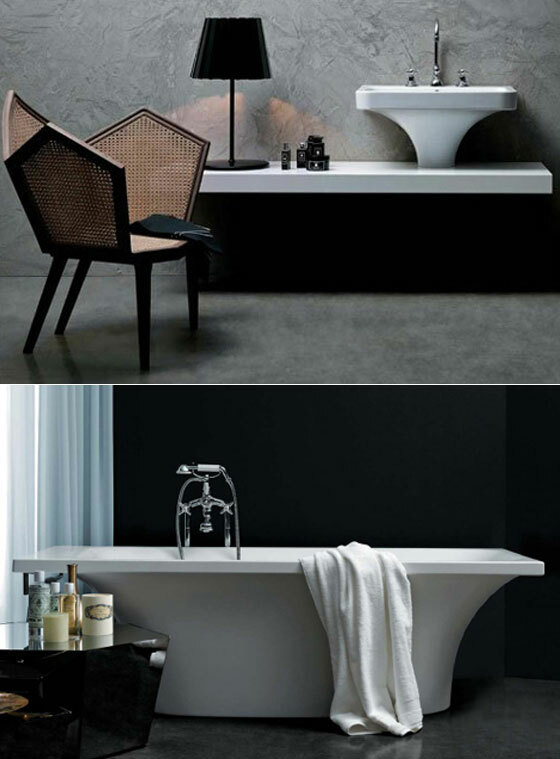 Below are 14 examples of what we thought were beautiful and minimalistic designs to bring calmness and elegance. 1. 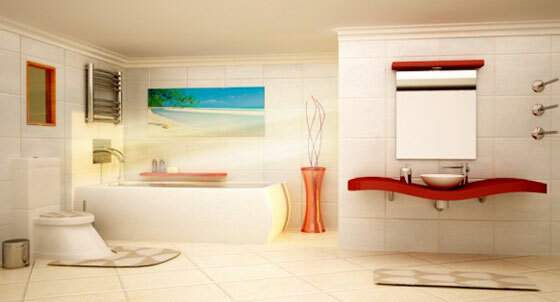 This fuchia burgandy color makes this bathroom come alive. 2. This large mirror plays the perfect balancing act between the natural stone wall and the over-sized chandelier. 3. 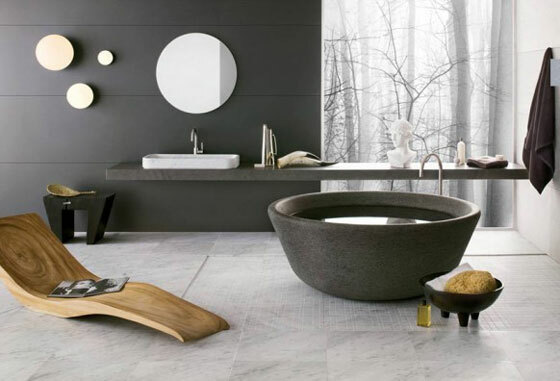 The repeating sinks balance the weight of the stone bathtub on the opposite side of the room. 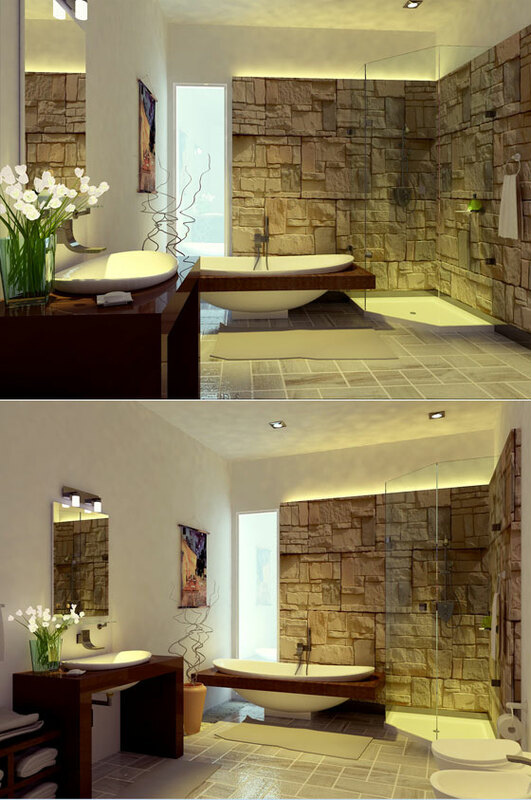 All the elements including the tinted glass divider are a warm neutral shade, reflecting a harmonious bathroom. 4. 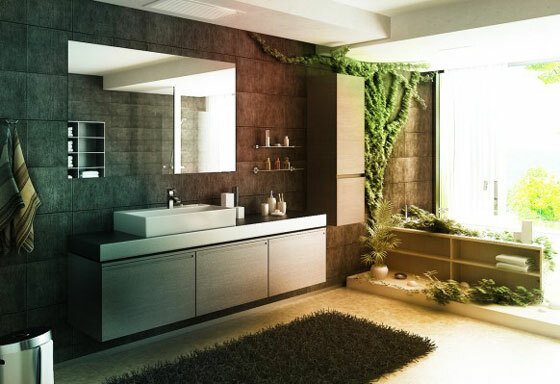 The rich textures enveloping this bath lend an exotic experience to a modern space. 5. Wood elements always infuse a feeling of warmth and intimacy. 6. Primary shapes play into different forms here while the lounge chair gives the space an organic touch. 7. 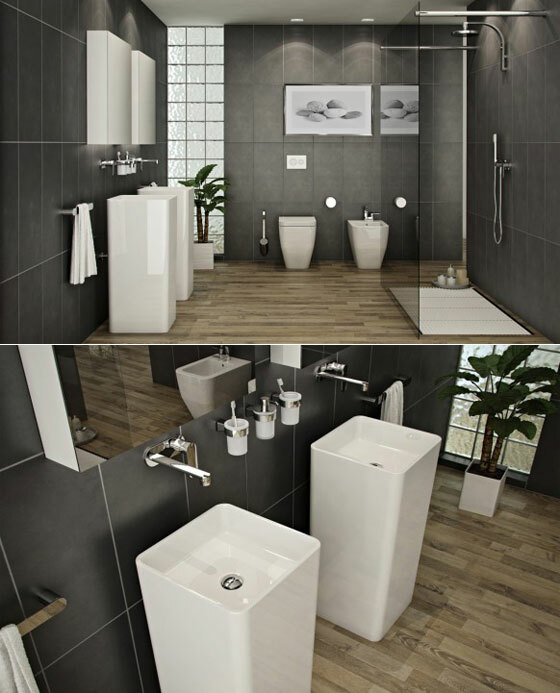 The complete collection revealed by Azzurra of sinks, tubs, toilets and bidets is designed in larger proportions, making a bold style statement in your bathroom while fusing function with fashion. 9. 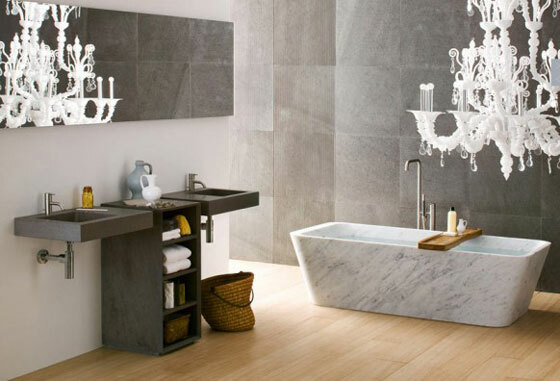 Modern Glamour for a bathroom that raises the bar. 10. 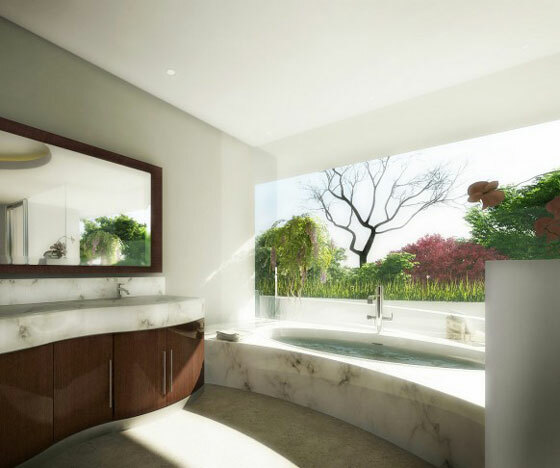 This bathtub is tucked away in a cozy corner where the warm sunlight shines in making the experience extra special. 11. 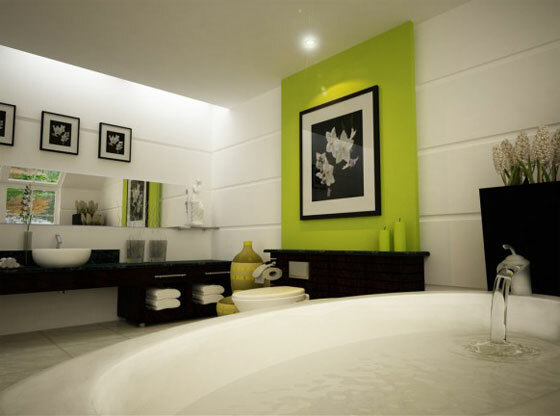 Lime green, white and black make a sensual and casual color scheme that calms the soul. 12. 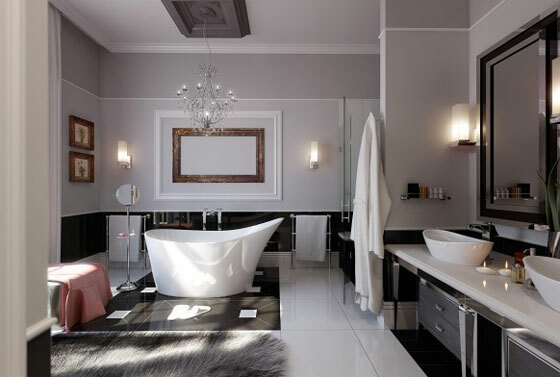 This brilliant bathroom is huge but warm and inviting. 13. This cozy bathroom gets lots of sunlight and a panoramic view of the outdoors.